Woodbury Police Chief Kevin Mooneyham, right, speaks with Tennessee Highway Patrol Trooper Gary Myers as they investigate a fatal accident on S. McCrary St. Sunday. 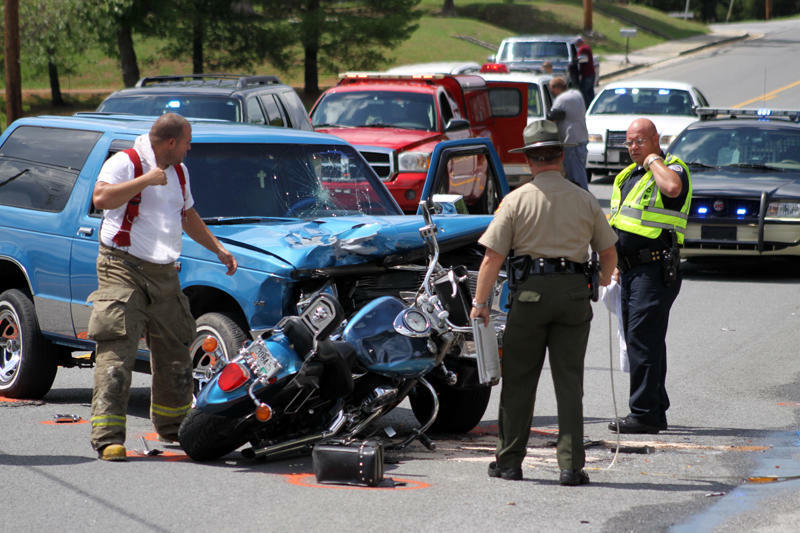 An accident involving a motorcycle and a Chevrolet Blazer claimed the life of the driver of the motorcycle Sunday afternoon. The accident occurred at around 1:30 p.m. at the intersection of South McCrary St. and Rogers St. According to Woodbury Police Chief Kevin Mooneyham, the preliminary investigation shows a 1988 Chevrolet Blazer being driven by Buford Weeden of Rogers St. in Woodbury was traveling southbound on South McCrary St. and made a left turn onto Rogers St.
Weeden apparently failed to yield the right-of-way to a 2003 Yamaha motorcycle being driven northbound by Paul Nicholson, also of Woodbury. Mr. Nicholson was pronounced dead at the scene. In addition to the Woodbury Police Department, the Tennessee Highway Patrol is also investigating the accident. Woodbury Assistant Police Chief Lowell Womack, Cannon County Sheriff’s Department Sgt. Randy Neal and Deputy Travis Turney assisted with the investigation and traffic control at the scene. Cannon County EMS and the Woodbury Fire Department also responded to the accident.